The Super 8 Houston/NASA/Webster Area Hotel is your home away from home, whether on pleasure or business. The Super 8 Houston Hotel offers their guests a Free Hot Super Start Breakfast, Hot Fresh Waffles, Fresh Fruits, Pastries, Bagels, Cereals, Muffins, Juices, Milk, and Folgers Coffee. Amenities at the Super 8 Houston/NASA/Webster Area Hotel include - Free Wireless High Speed Internet, Free 24 Hours Coffee, Free Local Calls, Free USA Today, Free Parking, Outdoor Pool and Hot Tub. Business Center with Computer access. Conveniently located mid-way between the cities of Houston and Galveston. Perfect home base for tourists as well as the business traveler. Of course our city has its own treasures. Space Center Houston is within 1 mile of the hotel. Gulf Greyhound Park is a 10 minute drive. The hotel is 5 miles from Clear Lake with all the water sports it has to offer--yachting, sailing, parasailing, and much, much more. The Armand Bayou Nature Center is 7 miles from the hotel. Our community, although in the forefront of the technology boom, can transport their visitors into a rich historical voyage - Battleship Texas, San Jacinto Monument, Historic League City, Kemah Boardwalk, and Old Seabrook. 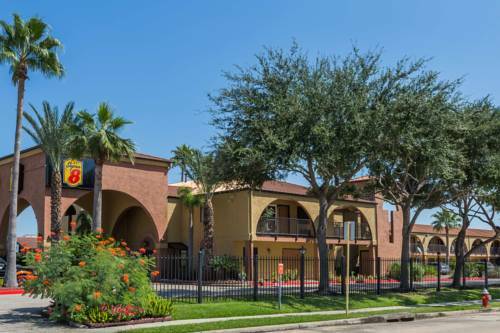 Come stay with us at the Super 8 Houston NASA/Webster Area and enjoy everything that our city has to offer. Ask about our connecting rooms, Great for families. Max 2 pets allowed for non refundable Fee of 25 USD applies per pet per night and a pet sanitation fee, if applicable is 250 USD. Guest must call the hotel to make Pet Friendly reservations subject to availability. All other rooms, non refundable charge of 75 USD per pet will apply. Children 16 and under stay free with an adult. All guestrooms are equipped with 40 inch LED Flat panel TVs with over 100 channels for free.